VICTORIA, B.C. – The Victoria HarbourCats are excited to announce that Nick Pivetta will attend the HarbourCats Hotstove this Saturday at Yates Street Taphouse. Additionally, Pivetta’s game-worn jersey from the HarbourCats first-ever game on June 5, 2013 in which Pivetta pitched eight innings and earned the win will be auctioned at the Hotstove. 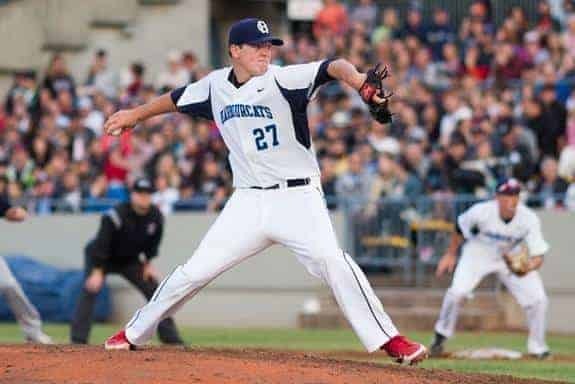 Pivetta, a native of Victoria, was the Opening Day starting pitcher for the HarbourCats in their inaugural season in 2013. The right-hander, who played in the BCBPL for the Victoria Eagles and graduated from Lambrick Park Secondary, was drafted later that month in the fourth round of the MLB draft by the Washington Nationals. In July 2015, Pivetta was traded to Philadelphia in exchange for Jonathan Papelbon. Pivetta is on the major league radar, being named Pitcher of the Year in 2016 for the double-A Reading Fightin Phils and finishing the season making six starts at triple-A Lehigh Valley. 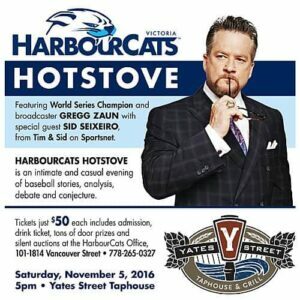 The HarbourCats Hotstove takes place this Saturday, November 5 at Yates Street Taphouse. The HarbourCats Hotstove will be headlined by ‘meet and greet’ as well as Q & A sessions with special guests, 16-year MLB player and current Sportsnet baseball analyst Gregg Zaun, and Sportsnet personality Sid Seixeiro. introduced as HarbourCats head coach. Local personality Mira Laurence will serve as the evening’s emcee. Tickets for the event are still available for $50 and include admission, drink ticket and door prizes. Silent auctions will also take place throughout the evening. There will be special offers at the Hotstove on 2017 HarbourCats tickets (vouchers) and merchandise. Only a few days remain to take advantage of the special offer of free 2017 playoff tickets with purchase of 2017 season tickets. The offer expires Monday, November 7. The offer is contingent on the HarbourCats qualifying for the playoffs, which they did in 2016 after setting a league record for wins. The HarbourCats have increased their win total in each of their first four seasons. Over 60,000 fans attended HarbourCats games in 2016 for an average of 2,239 fans per game. Secure your favorite seat today for the 2017 season. *All prices listed are base price, and do not include fees or GST. The HarbourCats are staging their second consecutive fan vacation to Seattle in 2017 to see the Blue Jays take on the Mariners. Travel on Wilson’s Transportation buses from to and from Victoria and Seattle. Ferry cost also included. Field level tickets for all three Blue Jays @ Mariners games at Safeco Field. Two nights at the Hilton Embassy Lynnwood. Total cost is $798 per person (based on double occupancy). Different rates available for triple as well as single occupancy. 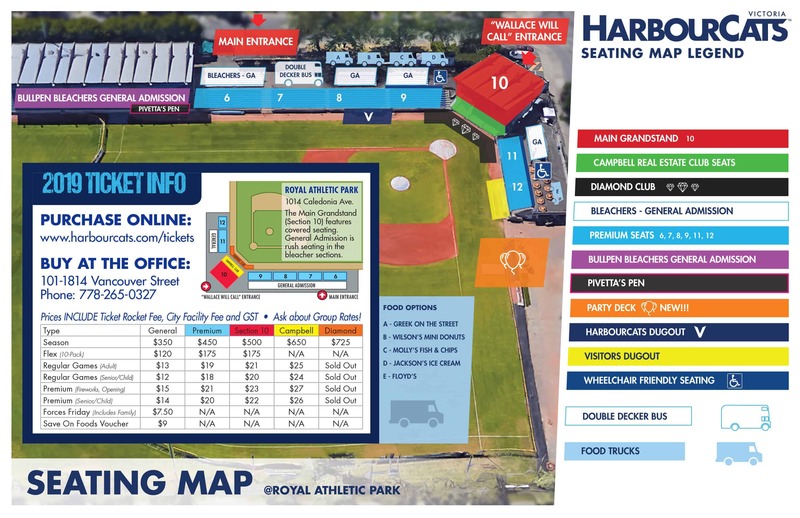 Registration for HarbourCats season ticket holders is $725 (based on double occupancy). The trip is not expected to interfere with the HarbourCats home schedule, as the team is expected to be on the road during this time. The HarbourCats office (1814 Vancouver Street, 778-265-0327) is open and operating under off-season hours.